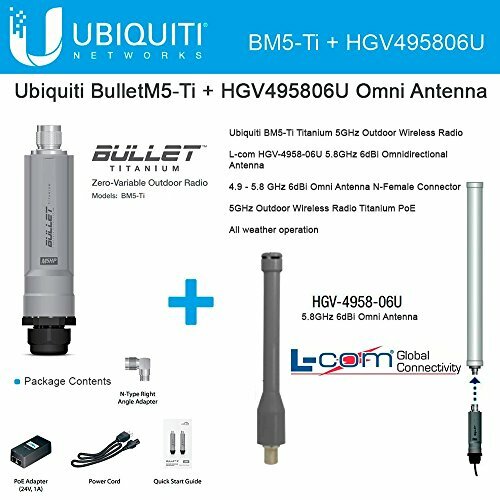 Bullet M Titanium is a wireless radio with an integrated N-Type RF connector that can be directly plugged in to any antenna to create a powerful and robust outdoor Access Point, Client, or Bridge. The HyperLink brand model HGV-4958-06U is an economical yet high performance 6 dBi omnidirectional antenna designed for broadband frequency operation from 4.9 GHz to 5.8 GHz. Compact and lightweight, these antennas are ideally suited multipoint applications where wide coverage is desired.